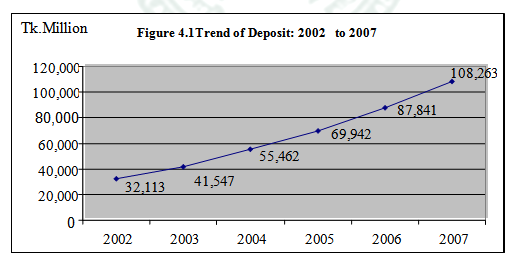 The trend of deposit increasing of IBBL last four years is so much satisfactory. Total deposit stood at Tk 87,841 million as on 31st December as against Tk 69,942 million of the preceding year registering an increase of Tk.17, 899 million, i.e. 26%growth as compared to the growth rate of 17% of the banking sector during 2004. Investment of the Bank stood at Tk. 35,238 Million as on 31.12.03 as against Tk. 27,437 Million as on 31.12.02 showing an increase of Tk. 7,801 Million i.e. 28 percent against 13 percent growth of investment of the Banking sector. 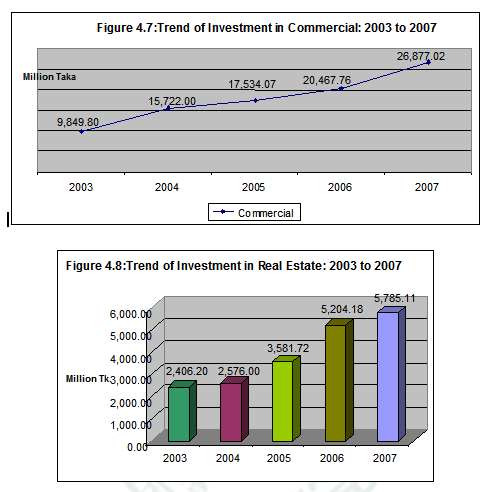 This increased growth of investment of the Bank in 2003 may be attributed to the trust given to foster investment and to reduce the Surplus Liquidity of the Bank. Despite tremendous popular support spectacular success in terms of mobilization of deposit and distribution of profit Islamic banking in Bangladesh yet to achieve the desired level of success due to the absence of appropriate legal framework for carrying out Islamic Banking operations in the country. All the government- approved securities in Bangladesh are interest bearing; Besides, Islamic Money Market in Bangladesh is yet to develop. As a result the Islamic banks, which are committed to avoid interest, cannot invest the permissible part of their Statutory Liquidity Reserve and short Term Liquidity in those securities. IBBL is experiencing different problems including the investment program under the Islamic Shariah.Due to this, it is yet to conduct the some schemes which are agreed with the Islamic law and some of the schemes has already been closed and which are under operations are not out of flows. The following section highlights the major findings of the problem that are associated with the investment program of IBBL. The Sahib-al-mal (in this case the bank) bears all the loss in Musharaka may result in moral hazards. Clients don’t repay the profit in time. Bank has to bear the risk of goods until those are delivered to the client and the bank is also responsible for any damages of the goods in this period. The bank will face problem if the client refuse to satisfy the contract. Lack of marketing expertise for purchasing of an asset. Maintenance of the asset and bearing all cost associated therewith or with replacement if the asset is deficient or fails to perform the service for which it has been leased. This is likely to demand specialist knowledge and expertise about the asset being leased disposing of the asset, when the asset is no longer be needed. Uncertainty about the total life of the asset. The decoration of the branches is older than other commercial banks. They don’t use the Share Mode of investment. Absence of Islamic Money Market. Absence of Islamic Economic system in Bangladesh. In the money market of Bangladesh there is no easy provision to take short time loan from the bank. The Bank should disburse total invested money at once to the clients to achieve full benefits of invested money. IBBL should more emphasize on their marketing effort and try to increase their sales force. IBBL should appoint a Customer Relation Officer at every branch level. IBBL should make their credit approval and monitoring system more customers friendly. IBBL should try to reduce their loan issuing and disbursement timing. IBBL should increase their profit rate on different deposit scheme. IBBL should try to attend different type of target customer. IBBL should introduce long-term credit scheme like different types of 5 years or ten years credit scheme. Maximum clients do not know about IBBL’s Loan schemes. They should carryout more promotional activities to make clients aware about their offers. It was observed that, IBBL is absent in TV, Print Media, Bill Boards, and Sponsorships etc. Bank should advertise about itself so that it can attract more clients. That will increase the business volume of the bank. To avoid bad debts IBBL should more emphasize on Lending Risk Analysis (LRA) and try to conduct sensitivity analysis. The government should take an initiative to open an Islamic money market in Bangladesh. 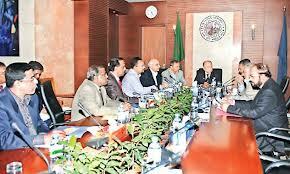 The government should also take an initiative to develop a legal framework of Islamic banking in Bangladesh. The people should improve their morality for the proper use Islamic banking in Bangladesh. They should return the amount of profit in due time. Most of the people in our country have a bad impression about IBBL’s operations regarding indirect generation of interest, which means no difference between investments of IBBL loan/credit/advance of conventional banks for this reason. They are not too much interested to investment with IBBL because majority of our people have no proper knowledge about the activities of Islami banking as well as its investment machanism.they don’t know mark up is accepted Islamic Shariah. The bank is committed to run its all activities as per Islamic Shariah.IBBL through its steady progress and continuous success has, by how, earned the reputation of being one of the leading private sector bank of the country. The bank has shown steady progress in this important sector. Main items of import (by the help of IBBL) machinery, garments, fabrics and accessories, ships for scrapping, rice, pharmaceuticals etc. where as main items of exports are jutegoods, readymade garments, leather, frozen fish, fertilizer etc. IBBL’s capital adequacy, deposits, reserves, earning per share, export, import and remittances are increasing day by day. So, no doubt IBBL is a growing profitable financial institute and its strengths is high. Chapra, M.U, (1995). Towards a Just Monetary System. Leicester: The Islamic Foundation. Kabir at el, Text Book on Islamic Banking, Islamic Economics Research Bearue, Dhaka, 2004. Various types of publications of IBBL. Various lecture sheets of IBTRA.